Sometimes living abroad can be most challenging around holiday times. One cannot help but feel a longing for home life as they skim through pictures and read statuses from friends and families celebrating back home. Though pangs of homesickness set in most around holidays, expat communities in Taiwan help ease the agony of missing festivities back home. 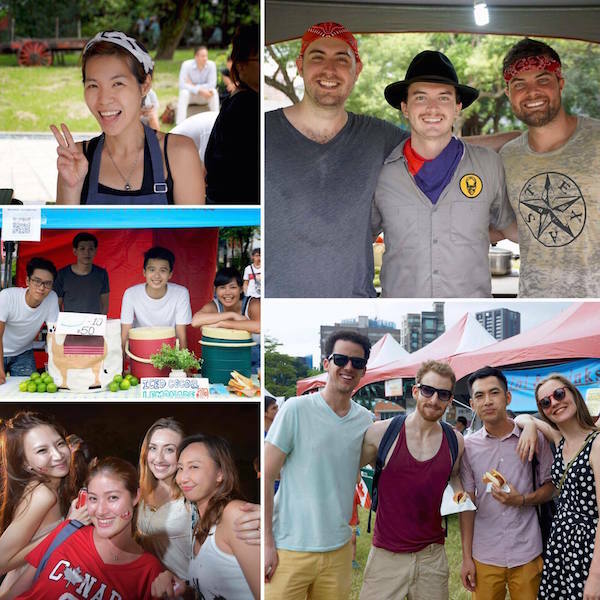 In Taipei, the Canadian Chamber of Commerce hosts a Canada Day celebration to give expats and travelers a chance to celebrate while also sharing Canadian traditions with the local Taiwanese community. 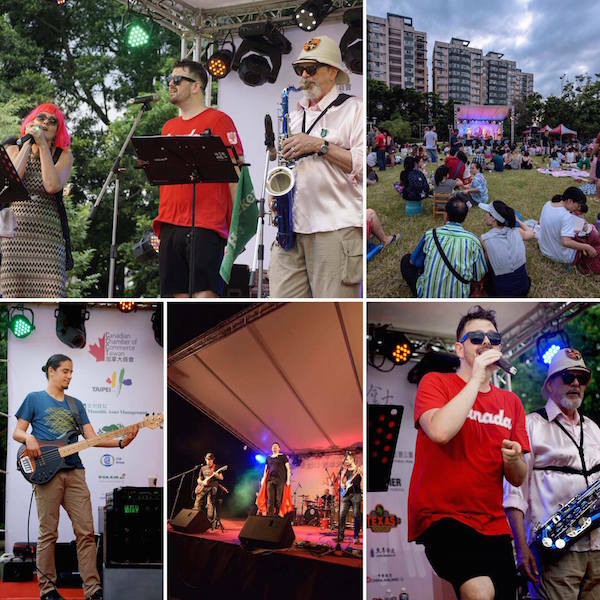 This year, Celebration Canada was held on June 25th, 2016 at the Taipei City Hakka Cultural Park from 1:00-9:00pm. 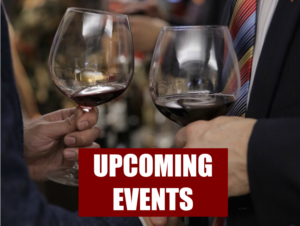 This year’s festivities included live music, a variety of local food and beverage vendors, a children’s activity center, an art corner, and even a bull-riding contest! A round-trip ticket to Canada from EVA Air and China Airways, food coupons for Roots and Texas Roadhouse, hotel accommodations with Xitou Le Midi (米蒂亞套房雙人住宿券) and Zhongli Le Midi hotel accommodations (中壢米堤雙人住宿券), MacKay Charity Gala Tickets for two from the CCCT, Afternoon Tea for two at La Rotisserie, various items from Roots Taiwan, pearl bracelets from 引雅珠寶-珍珠手鍊, several bottles of Canadian red wine, various items from China Airlines, coupons from Alleycats Pizza, coupons from Carnegie’s Taiwan, coupons and coffee mugs from Campus Café, a number of Canada Beef Travel Kits, several coupons from The Diner, several packages of Canadian nougat, and three Le Midi Gift Bags. The CCCT would like to thank our generous donators for our raffle prize. It gets bigger and better every year! Though the day started out cloudy and grey, the rain stayed away and everyone had a lovely time celebrating Canada! Many participants showed up in Red and White to show their Canadian pride! Everyone enjoyed the delicious food, music, and activities. 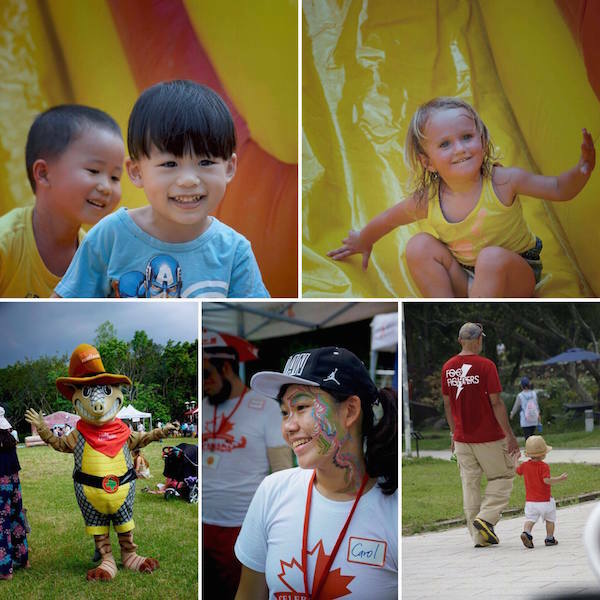 Canada Day is a fantastic family affair, and it shouldn’t be missed by anyone traveling to Taipei in late June. 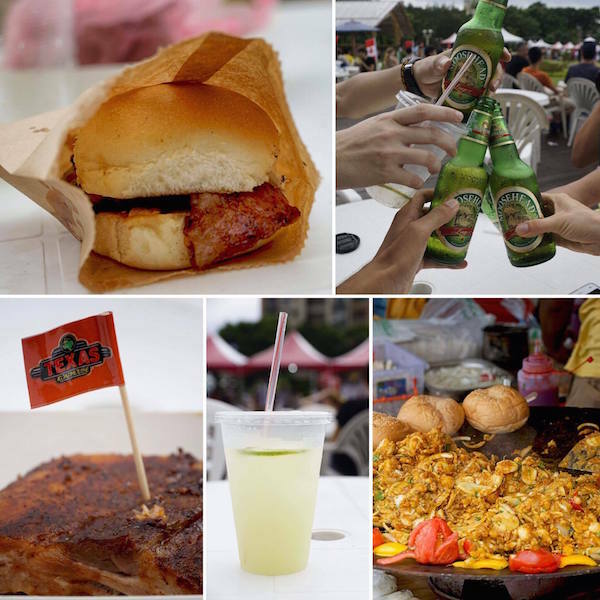 The diverse list of food vendors this year had something tasty for everyone! Texas Roadhouse, a CCCT corporate sponsor, cooked up some smoky and delectable BBQ ribs and chicken. Mayur Indian Kitchen served up some tasty vegetarian and non-vegetarian Indian options. Three Idiots Toast and Curry offered some wonderful vegetarian grilled cheese sandwiches and curries. Maple Maple, a CCCT corporate sponsor, offered some typically delicious Canadian treats. Merkel and Meat Mate served up sausages all day long. Chelsea’s offered some delectable grilled cheese sandwiches, and Uncle Kunkel distributed some savory Tex Mex. Finally there was also a booth called Slyders selling sweet and tangy maple glazed pork sliders that absolutely hit the spot! This year the kid’s zone featured a bouncy castle and a blow up slide. There was also a face-painting booth and Canada-themed temporary tattoos so everyone could show their Canadian Pride! The children were grinning from ear to ear as they enjoyed all of the festivities! This year’s event would not be complete without the amazing lineup of bands. Nothing is better than dancing the day and night away to some fantastic live music. We heard from Tony Taylor and the Rockits, Jesse Helton and The Green Machine, Pineapple Plaid, DC and the Funky Duds, Sam Lin, Red Cliff, and a special band that was organized just for Celebration Canada called the Canadian All-Stars! Many thanks to Brandon Thompson for organizing such an outstanding line-up of fantastic bands to entertain us throughout the day and evening. 1st Place: Nick Coulson snatched up his grand prize with a whopping 95 seconds on the mechanical bull. 2nd Place: Jenna Robinette placed second with a very respectable 81-second ride. She took home a NT$1,000 coupon from Texas Roadhouse. 3rd Place: Tyler stayed on the mechanical bull for 70 seconds and took home a NT$1,000 coupon from Roots for his efforts. Our bull-riding minors also took home prizes for showing their prowess on the mechanical bull. 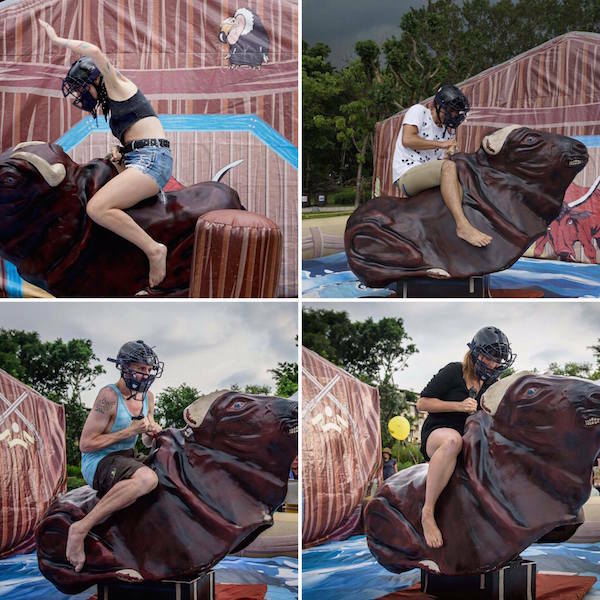 Natalie took home a NT$1,000 coupon from Texas Roadhouse for riding the bull for 164 seconds. Great job, eh! We would like to thank EVA Air and China Airlines for offering two round-trip tickets for our mechanical bull prize and for our raffle prize. The success of Celebration Canada is all thanks to the participants from both the Taiwanese and foreign communities. Make sure to join us again next year for the 150th year celebration of Canada Day in Taiwan, which will be held on Canada Day, July 1, 2017.